Free To-Do List Manager : Task Coach is a easy and efficient way to manage your personal task and ToDo list on your Windows, Mac or Linux computer. Task Coach Personal Task Manager was designed to help you to deal with composite tasks, subtasks, notes and to-do lists fast and easy. Task Coach grew out of the frustration that well-known task managers, such as those provided with Outlook or Lotus Notes, do not provide facilities for composite tasks. Often, tasks and other things To-do consist of several activities. Task Coach is designed to be a compact yet advanced task organizer that allows you to easily manage your tasks by creating, editing, and deleting tasks and subtasks. Each tasks have a subject, description, priority, start date, due date, a completion date and an optional reminder. Tasks can recur on a daily, weekly or monthly basis. 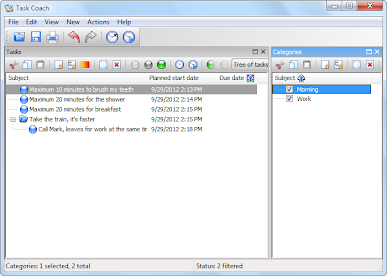 Tasks can be viewed as a list or as a tree. Attachments can be added to tasks, notes, and categories by dragging and dropping files, e-mail messages, or URL's onto a task, note or category. Tasks, notes, effort, and categories can be exported to HTML and CSV (comma separated format). Effort can be exported to iCalendar/ICS format as well. Task Coach is available in portable version, you can use it on your USB flash drive, iPod, portable hard drive. Download free Task Coach for Windows. Download Task Coach Portable for Windows. Task Coach file size 11.5MB.